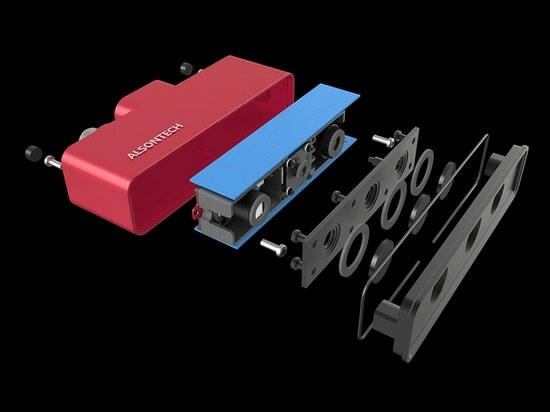 Group: Alson Intelligent Technology Co., Ltd.
A well-known valve manufacturer started automation renovation of the machining production line to solve the problem of backward production process and poor product quality. The automatic loading and unloading process is a difficulty of the renovation. In traditional production, loading and unloading are completed by workers. However, when workers get fatigue after carrying the cast iron workpieces for a long time, there might be errors for the feeding direction, thereby reducing the yield of the workpiece and increasing the wear of the lathe equipment. Besides, the efficiency of manual loading is seriously affected by the external environment. 1. The workpieces passed by the conveyor have different positions and postures, so automatic loading cannot be achieved by robot programming. 2. Multi-variety products are produced on the line. The coming model is uncertain, so the production line needs to be flexible enough. 3. The workpiece is highly reflective, which is a difficulty for common vision positioning products. 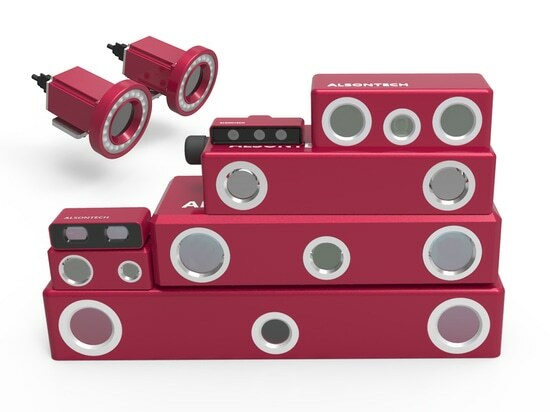 Alsontech adopted the AT-S1000-01A robot 3D positioning system to help the six-axis robot complete the automatic loading and unloading operation. The workpiece stops when passed to the loading position by the conveyor. The 3D camera acquires the point cloud data of the workpiece, combines the intelligent AI technology analysis to obtain the model, coordinates and posture of the workpiece, and guides the robot to accurately grasp and place the workpiece to the CNC machine in the set posture. 1. The model and 3D coordinates of the workpiece are quickly obtained by point cloud technology plus AI intelligent analysis. 2. It takes only around 20 minutes to add the data model for new products, which can meet the production needs of small batches and multi-varieties and achieve truly flexible positioning. 3. Light filtering technology solves the reflection problem. 1. Fully automatic loading operation frees workers from heavy manual labor and reduces labor costs. 2. Fast and accurate loading and unloading effectively reduce the wear of CNC machine tools and improve the operation accuracy and efficiency. 3. The 3D positioning system greatly improves the flexibility of the production line to meet the production of different types of products. 4. The 3D positioning system works closely with robots and CNC machines to quickly optimize the workflow. 5. The robot positioning system and the robot run stably, which effectively avoids the influence of environmental factors on the loading operation. In September of 2017, Alsontech won the “Most Popular Enterprise Award” in Express to Silicon Valley Innovation and Entrepreneurship Competition. 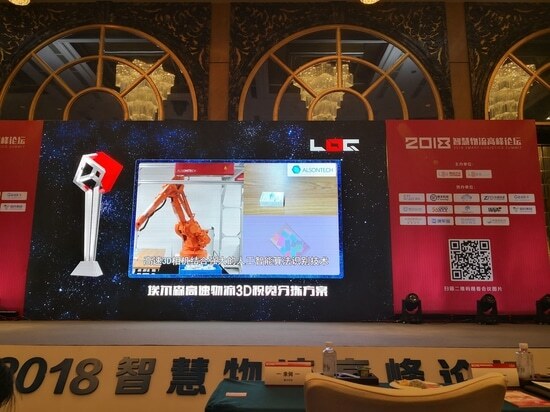 In May of 2018, Alsontech won the "LOG ISC Innovative Product Award" with its "High speed logistics 3D vision sorting solution". In November of 2018, Alsontech won the first prize of G60 Science & Technology Innovation Valley Excellent Talent Innovation and Entrepreneurship Competition. In July of 2018, Alsontech received a letter of thanks from Haier Institute of Industrial Intelligence. In the letter, they fully affirmed our 3D vision technology. 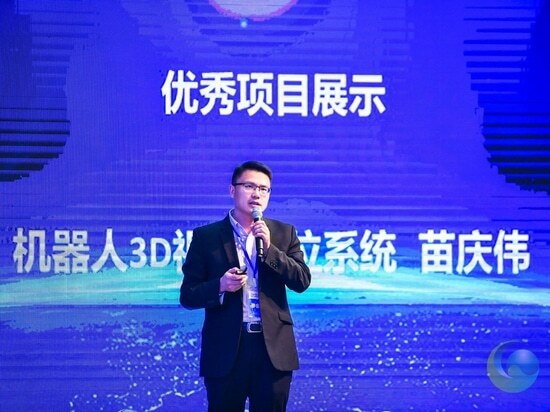 During the SCO summit, Haier invited the officials and press of the SCO member states for a demonstration.It is our honor that our 3D vision solution was also demonstrated.